Just when you thought it was safe to go back in the water, along comes the "Stelly"! Finally! A pickup for your Tele® that gives you a usable neck position. Clarity and brilliance are the key words here. Same as the "Bars" but with "Dawgear" covers. Available in creme and black. 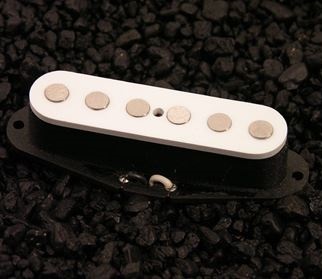 Like it's namesake, the Dirty Harry Jr emulates the tonal characteristics of a P-90 pickup. Have an Ordering or Technical Question? Copyright © 2019 Rio Grande Pickups. All rights reserved.